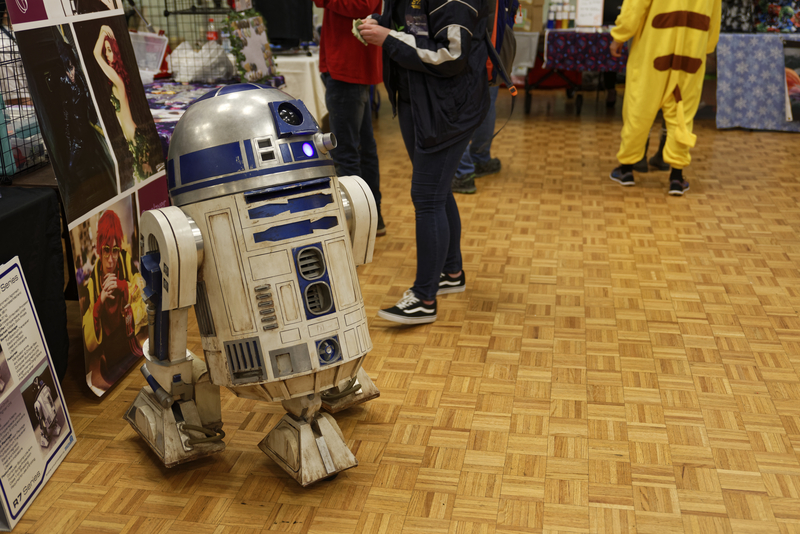 On Feb. 17 and 18, ETSUCon transformed the D. C. Culp University Center into an overflowing parade of cosplayers, artists, gamers and pop-culture enthusiasts alike. “There’s a well-spring of nerd under ETSU’s crust, and we’re just tapping into it,” said Zachary James, ETSU Chairman of annual events and adjunct faculty member for Japanese. Upon a quick sneak-peak on the night before festivities began, Con volunteers moved with a serious purpose on the 3rd floor. A group of them were assembling the layout for the 80+ vendors that would soon be filing into the Culp’s ballroom. Several of the organizational staff members of ETSUCon were also present, working hard alongside students and volunteers. “What I’m most excited about is watching people enjoy it. It’s a weekend just to relax and have some fun: especially for students,” said James. The Con’s Director, Nick Papworth, was also present as he feverishly coordinated special guests’ hotel arrangements, as well as reminding volunteers to eat dinner. It would be a long night before the games could begin. By 11 a.m. on Saturday, the event was an apparent success. The hallways and ballroom were packed with people from all around the region. Even Voltron decided to make an appearance. Panels, cosplay tutorials and dance contests were occurring in meeting rooms 4-6 in the Culp. In the Cave, dozens of TVs were flashing the likes of Super Smash Bros (OG, Melee and Brawl), Pokken Tournament (Pokemon x Tekken) among retro and next-gen games galore. There was, in fact, a serious SSB Tournament. It was so serious, nobody could even get close to the enormous projected screen. Magic the Gathering players loomed around every corner, and I hate to complain, but the only thing missing was food. Luckily, a vendor inside the ballroom peddling exotic Pocky flavors.